Why do elephants have such big ears? What's the difference between fog and mist? How did earthworms travel from Europe to North America? Be the brainiest guest at the wedding, the smartest slacker in the break room, and the cleverest delegate at your next networking event. Whether you're cramming for the quiz, trying to impress your friends, or simply in need of a knowledge fix, WHO KNEW? is the book for you. Filled with nuggets of wisdom to bolster your brain cells, there are plenty of tales here to surprise and delight even the most ardent trivia fan. From the plagues of the Middle Ages and the rules of Roman architecture to culinary customs, presidential assassinations, and the contents of James Bond's glass. And with a nifty test at the end of each section to keep you on your toes, you'll be ready for Mastermind in no time. 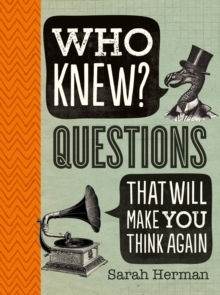 Galvanize your grey matter with this classic compendium, as you find yourself asking: who knew?